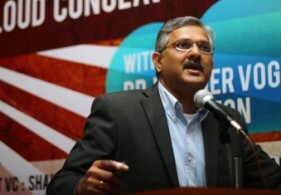 “It is a wonderful time to take smart risks and solve great problems”, Vaidyanathan, CEO, Classle, shared the mood of the entrepreneurial zeitgeist which embodies Bangalore, India’s answer to the Silicon Valley. He chronicled his entrepreneurial journey, sharing his cherished dream to bring social transformation through education and learning. With the “crest of the pyramid” getting access to the best of the worlds in education, he shared his motivation to ensure that the “rest of the pyramid “are also empowered through a technology platform which bridges social, linguistic and digital divide in the country. He attributed his success to the excellent infrastructure provided by AWS, which unbundled various architectural elements and provided them on demand and engagement with national initiatives such as NPTEL in the educational domain. He also confessed his worst decision was to outsource the entire development of the technology platform. He advised the entrepreneurs to have a multi-year road map with secondary revenues, drawing from his wealth of experience in creating an innovative insight based recruitment services out of the social learning network. “Entrepreneurship is not an ego trip”, he cautioned the entrepreneurs, highlighting the raison d’etre of business to create value for customers. “Just because you have passion, VCs aren’t obligated to give money”, he advised the entrepreneurs to focus on the essential business fundamentals, irrespective of the superiority of the technology platform used in the business.